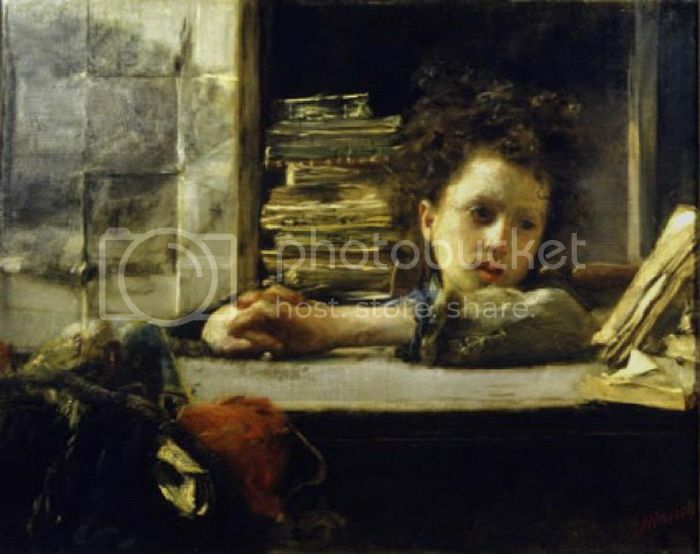 Happy Birthday Bagginses ~ 2012, with poems by jan-u-wine and art by Antonio Mancini. This year, for the Baggins birthdays, jan-u-wine has written a pair of related poems, one from Bilbo's point of view, one from Frodo's. The poems are set at the time of Frodo's first birthday after the death of his parents. If they died boating in the summer, the loss, in September, would have been very fresh. The poems capture both characters beautifully, and in a subtle range of mood. While the poems don't portray a "happy" birthday, they hint at the rich relationship, and many truly happy birthdays, that will come. Happy birthday, dear Bilbo and Frodo! of a great and silent tree. and yet my heart fears….. It will be our birth-day then. This small lad and I.
that only Da ever heard. which I am meant to do sums). Mancini worked at the forefront of [the] Verismo movement, an indigenous Italian response to 19th-century Realist aesthetics. His usual subjects included children of the poor, juvenile circus performers, and musicians he observed in the streets of Naples. While in Paris in the 1870s, Mancini met Impressionist Edgar Degas and Edouard Manet. He became friends with John Singer Sargent, who famously pronounced him to be the greatest living painter. His mature works show a brightened palette with a striking impasto technique on canvas and a bold command of pastels on paper. In 1881, Mancini suffered a disabling mental illness. He settled in Rome in 1883 for twenty years, then moved to Frascati where he lived until 1918. During this period of Mancini's life, he was often destitute and relied on the help of friends and art buyers to survive. After the First World War, his living situation stabilized and he achieved a new level of serenity in his work. Mancini died in Rome in 1930 and [was] buried in the Basilica Santi Bonifacio e Alessio o the Aventine Hill. ~ Jan-u-wine's "The Master Observed" and "Frodo's Lamp", with art by Grimshaw and Carlsen. ~ All entries featuring jan-u-wine's poems. Utterly lovely and deeply moving as always. Happy Baggins Birthday to both of you!! I absolutely love both of those poems. Jan's word-pictures are exquisite, and I hope they, too, go ever on and on. I hope they, too, go ever on and on. Me, too, like the Road. Thanks, Shirebound. Happy birthday to these wonderful hobbits! It's good to remember the sad times together with the happy times. thank you so much, Mews! It's very nice to *see* you here! I was wondering how you two would celebrate the day. :) I love the Bilbo poem the most - that was just great. And I like the ending of the Frodo one too. Happy Day!!! thank you, Antane! Very glad you enjoyed the post. A happy day to you, as well! this odd uncle of mine"
I'm very pleased the birthday post suited. Jan wrote the Frodo section of the poem inspired by that painting. I think it, and the poem that can of it, are so, so good. Happy Baggins birthday to you, too! Many thank to both of you, Mechtild and Jan, for such a beautiful post to mark this very special day. You are very welcome, Paulie! Thank heaven Jan was inspired to write these beautiful, perceptive pieces. Otherwise it would have been a picture and a "Happy Birthday, Bilbo and Frodo!" She's got such a gift. I'm glad you found that sad pic to inspire Jan. That would be a little grieving Frodo-lad. I'm glad he has his Bilbo to rescue him and, in turn, rescues his Bilbo. Dealing with emotions would be "more dangerous, still" for Bilbo than entering a dragon's den, as you depict, Jan. I love his fretful worrying, more fretful by his Bagginsy procrastination. What is he avoiding thinking on in that "pocket dark sky"--I love that phrase. A lovely, loving treasure seeker. Frodo-lads's images of his lost parents mediated through older memory are so sad--an orange-blooded moon indeed--ripeness spoiled. It's good to hear the despondent lad, unmediated, with rising spirits at his older cousin's invitation to kinship. Gosh, Lavender, what a beautifully written appreciation of the pieces. Your heart and mind and eye attend so closely and well. Thank you for your comment. Like the poems, it prompts much thought. Such a beautiful birthday tribute. That picture of young Frodo is so sad and lovely. Thanks to both of you for such loveliness. The painting is so evocative.. the out-of-focus appearance a perfect reflection of the jitteriness (and unreality) that Frodo was feeling at this time. Poor Mancini (artist)... it mentions in the bio that his mental health deteriorated -- I always wonder, with these painters, whether it was the lead in the paints. Constant exposure to lead? But I could be wrong, perhaps those kinds of paints (used by artists), didn't contain it. In any case, it's very sad. Jan-u-wine's poems, as ever, take me to another place. (I feel I'm really THERE in the Shire.) This is quite a feat, in my case, as I'm so pulled-down, daily, by the realities of my job that I'm amazed when something can draw me out of it. But good art, good writing will do that, thank God! Such a gorgeous site, all in all. It's like an oasis. Mary! What a pleasure to see your comment. I'll tell Jan that you've dropped by. the out-of-focus appearance a perfect reflection of the jitteriness (and unreality) that Frodo was feeling at this time. I'm so pulled-down, daily, by the realities of my job that I'm amazed when something can draw me out of it. Oh, Mary. I'm sorry to hear your work environment is still so poor.